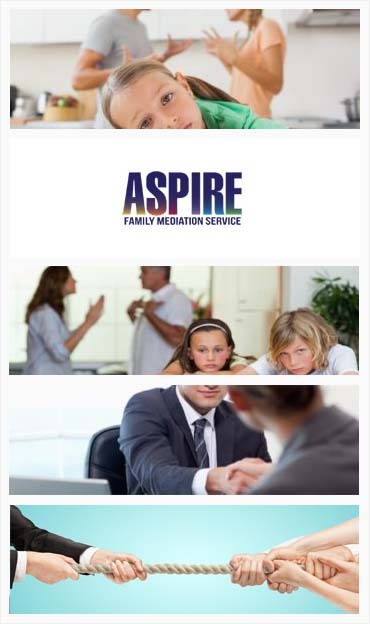 Going through a divorce is stressful, paritcually on parents, Aspire Family Mediation helps parents work out resolutions and solutions. It is stressful for every party concerned when a relationship or marriage breaks up. In fact, according to psychologists, it is one of the most challenging events in life that people will ever face. With this in mind, parents are often extremely apprehensive about the implications for children and themselves. However, this is a natural part of the separation process and with good advice and mediation to fall back on you will find that you can cope with this change in your life. It is best to keep children informed through the process of divorce and separation. Children are very good at picking up on tensions between parents and, whilst you do not have to fill them in on every tiny detail of the process, they will need some information suitable for their age group. Children will feel very insecure during this time and many children suffer from anxiety. The stability of the family which they relied upon is dissolving. It is obviously important to provide emotional reassurance and to emphasise routine and continuity during this time. Never use children as an emotional tool to score points from your partner. They will resent you doing this, and it is always counter-productive. Scheduling is one way to make sure that children are not unduly hurt by the divorce or separation process. Children like routine, and are reassured to know that the rhythms of their lives will not be irrevocably changed. Although your routines are parents will inevitably have changed it is important that children continue with their existing patterns. Setting regular meal times and bed times is one important way to give children a sense of stability. This will enable them to cope with transitions ahead. Although it is important to tell the truth to children about what is happening, try to avoid directly criticising your ex-partner. It may be that you have been badly damaged emotionally by your ex-partner, but be tactful when dealing with your children. After all, they will have to come to terms with their own relationship with each of their parents. It is best to talk to children together as this emphasises that you are able to make joint decisions, even if you do not live together. It is best to talk to children before you change your circumstances in terms of living arrangements. Be careful not to overload your children with detail, but sketch out the broad changes that are going to happen with them. As stated above, try not to criticise your ex-partner and stress that you are aiming to achieve an amicable relationship with them. Use age appropriate language and concepts when talking to children. A four year old will understand much less than a teenager, but will still pick up on changes to routine or emotionally charged atmospheres. Mediation provides a safe and secure environment to discuss how to address issues involving children. Through the process of divorce or separation it is important to look after yourself. This will be a very challenging time for you and it is important to maintain your social circles and activities as much as possible. Try not to seek comfort in bad habits such as over-use of alcohol and tobacco and keep yourself generally healthy through a good diet and exercise. Aspire Family Mediation helped meget things back on track, the case of which was stuck from a long time and I thank them forstanding beside me.